Special Price Flower Bouquets Fresh flower bouquets can contain a mix of different flowers or can be a single flower bouquet in a mixture of colors, or a single color. All our fresh flowers are of the highest quality, hand picked from the best flower farms in the market. You can be guaranteed that a cheap flower bouquet looks just as vibrant and spectacular as a regular price bouquet. We like to please our customers at FlowerFresh, and that means having a variety of great flower specials. A particular favorite for many people are rose flower bouquets, while others like the cheap flower bouquets that contain a mix of different types of flowers. 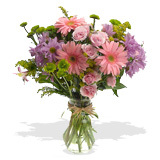 Pink Flower Bouquet Care: We have a very wide selection of pinks flowers. We have pink flower bouquets with a mixture of different flower types such as light pink roses, mixed with bold star gazer lilies beautifully complimented with light green hypericum. You will find pink flowers perfect for any occasion or to decorate your own home. Follow the basic care instructions for the flower bouquets, to ensure you maximize the vase life of your pink flowers. Make sure u cut the stems upon arrival and remove the foliage that will fall below the water line. Then place your pink flower bouquet in a vase filled with luke-warm water and flower food. Water Daily.